Roger Federer hasn't been winning Grand Slam tournaments lately, but one way he appeared to be unassailable was when he won the first two sets (in a 3-out-of-5 format) in one of the Slam events (Wimbledon and the Australian, French, and U.S. Opens). Before today, in fact, he was 178-0 when ahead two sets to none in a Grand Slam event. That streak is now over, as Federer lost at Wimbledon to Jo-Wilfried Tsonga, 3-6, 6-7 (3), 6-4, 6-4, 6-4. In winning its second straight NCAA College World Series baseball championship Tuesday night, the University of South Carolina established a number of streak-related records. Since a 1999 expansion of the tournament to 64 teams, the format has consisted of four phases, each double-elimination. First, the 64 teams are divided into 16 regional sites of four teams each. The winning team in a regional will either have a 3-0, 3-1, or 4-1 record. The 16 regional winners are then paired off into eight super-regionals, each a 2-out-of-3 series. The eight super-regional winners then go to the College World Series, with preliminary rounds (again double-elimination) producing two finalists. The final championship series is again 2-out-of-3. According to this article on the Gamecocks' 2011 title, South Carolina "became the first team to ever go 10-0 in an NCAA [baseball] tournament." The team went 3-0 in the regionals (beating Georgia Southern once and Stetson twice), then swept two from Connecticut in the super-regional. A 3-0 run through the World Series early rounds (beating Texas A&M once and Virginia twice) landed South Carolina in the final round, where it swept Florida, 2-0 (2011 game-by-game log). Last year, South Carolina dropped its World Series opener, before rebounding for four straight wins to make the championship finals. The Gamecocks then swept UCLA, 2-0, to capture the title. Adding South Carolina's closing six victories in last year's World Series to this year's 10 straight wins in the overall postseason and five straight in the World Series yields some monster streaks. As above-linked the article on South Carolina's 2011 championship notes, "The Gamecocks' streaks of 16 NCAA tournament wins and 11 straight in the CWS are both the longest all-time." In the top of the first inning Tuesday, the first eight Minnesota Twins hit safely, alternating singles and doubles. With those eight straight hits to begin the game, the Twins tied a Major League record accomplished six times before. 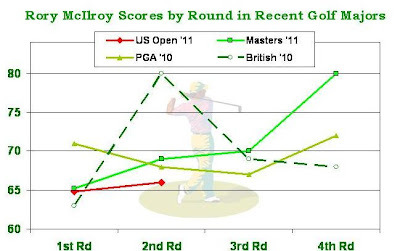 Rory McIlroy maintained his torrid pace all the way through the men's U.S. Open golf tournament, ultimately winning at 16-under-par (see Friday's posting, immediately below, for background). Second-place Jason Day, who finished 8 strokes behind McIlroy, went bogey-free (i.e., made par or better) on his final 45 holes. Baseball's Florida Marlins are now 1-18 for the month of June. Manager Edwin Rodriguez resigned before today's loss. 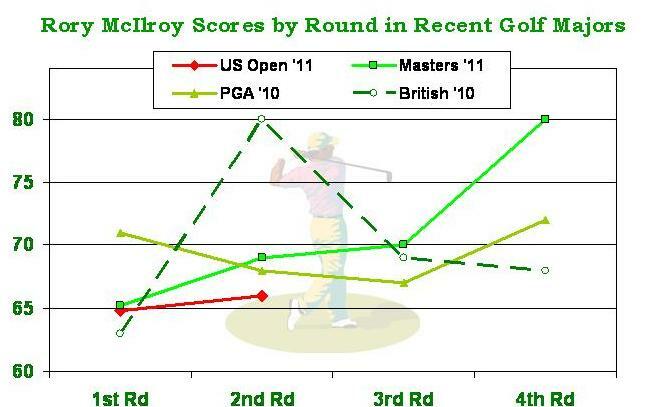 Northern Ireland's young Rory McIlroy tends to have a hot hand in the early rounds of the major men's pro golf tournaments, as I've graphed below (data source). However, he also sometimes goes erratic. He's done really well in his first two rounds of the U.S. Open, which is currently ongoing, achieving par or better on the first 35 holes he played, before double-bogeying the 36th (18th hole of Round 2). We'll see if he can retain his spectacular form on Saturday and Sunday to score his first victory in a major. Jose Bautista finished the month of May with 11 home runs, the most in the American League. It was the fifth straight month in which Bautista led the A.L. in homers (excluding March and October). Bautista led the American League in homers in July, August and September of 2010 and in April and May of 2011. The last player to lead a league in home runs (outright or tied) for five consecutive months was Jimmie Foxx. Foxx led the A.L. in homers in June, July, August and September in 1933 and in April in 1934. Naturally, an accomplishment for which one must go back 77 years to find an equal is quite noteworthy -- especially when that equal is the caliber of Hall of Famer Jimmie Foxx. Still, the above report of the record by Toronto right-fielder Bautista raised some questions in my mind. Was Bautista merely squeaking by with his monthly home-run leads or was he blowing away the competition? As I eventually came to realize, the report carefully qualifies the record in terms of Bautista's leading only the American League or leading "a league" in home runs during particular months. So, during how many of these months did he lead Major League Baseball overall in home-run output? The report also notes that March and October were excluded. 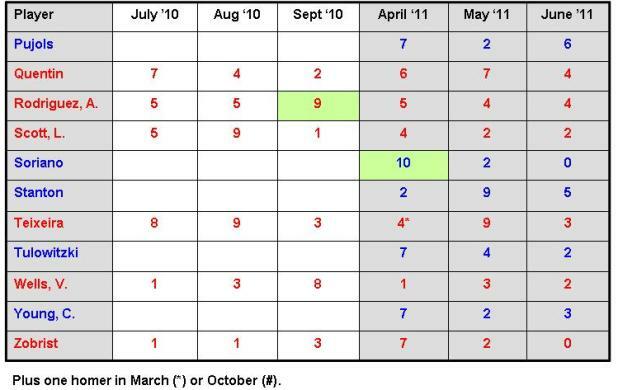 If one were to add March totals to April's and October totals to September's, would that change the conclusions? 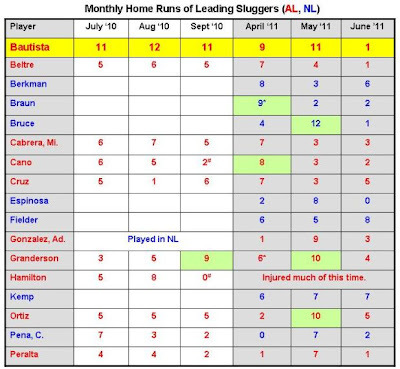 Using the superb Home Run Tracker website from ESPN's Stats & Information Group, I reviewed all MLB hitters' home-run output during 2011 and all American League hitters' homers for July onward in 2010. Each home run is documented on its own line of data and the lines can be sorted by hitters' names. 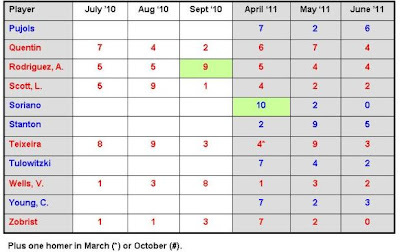 I simply perused down the screen, counting a given hitter's homers by month only when it looked like he had a sizable number of blasts (I overlooked 2010 NL data in the interest of time). The following chart presents the fruit of my labor (you may click on the chart to enlarge it, realizing that the top and bottom parts are separate, due to size limitations). It is during 2011 that things are more interesting, in my view. In April, Bautista's 9 dingers were surpassed by National Leaguer (Cub) Alfonso Soriano's 10. If we add National Leaguer (Brewer) Ryan Braun's 1 March homer to his 9 from April, he would also exceed Bautista. Yet another NL player, Cincinnati's Jay Bruce, exceeded Bautista in May, 12 to 11. For what it's worth, Bautista's home field, the Rogers Centre, currently ranks as one of the more hitter-friendly venues in MLB, according to "Park Factor" statistics. In conclusion, although there are some reasons to chip away a little bit at the magnitude of Bautista's accomplishment, a first-in-77-years record speaks for itself. In their NBA title-clinching, Game 6 win over the Miami Heat last night, the Dallas Mavericks put on their usual flurry of scoring spurts (play-by-play sheet). Most dramatic was a Mavs' 17-2 run, which took them from trailing 22-15 to leading 32-24 near the end of the first quarter. Dallas's DeShawn Stevenson, whose three-pointer put an exclamation point on the 17-2 run with 0:24 remaining in the first quarter, hit a pair of additional threes shortly thereafter, with 10:06 and 9:41 left in the second quarter, increasing the Mavericks' lead to 40-28. The Heat responded with a 16-1 spurt of their own (the Mavs' only point coming on a technical-foul free throw), to go up 44-41. Miami had little firepower the rest of the way, enabling Dallas to use more modest-sized runs -- 7-0 (from down 49-46 to up 53-49), 8-0 (from down 56-55 to up 63-56), and 8-0 (to expand an 81-77 lead to 89-77) -- to pull away. For the third straight year, Texas A&M has swept the men's and women's team titles at the National Collegiate Athletic Association (NCAA) track and field championships. Did Dallas have another big spurt late in Game 5 of the NBA finals? Of course it did. In immediate response to a 9-0 Miami run that put the Heat ahead 99-95, the Mavericks closed out the game on a 17-4 run to prevail 112-103 (fourth quarter play-by-play sheet). The Mavs, who also made 13-of-19 three-point attempts (68.4%), now lead the series 3-2. Another game in the NBA finals, another late Dallas spurt. Trailing to Miami 74-65 with a little over 10 minutes remaining in the game, the Mavericks went on a 17-4 run to take the lead, 82-78 (play-by-play sheet). Dallas held on for an 86-83 victory, tying the series at 2-2. The Miami Heat held on for an 88-86 win over the Dallas Mavericks, despite a 15-2 run by the Mavs in the third quarter. Miami now leads the NBA finals 2-1. The following chart says it all, as Novak Djokovic has fallen to Roger Federer in the semifinals of the French Open. You may click on the graphic to enlarge it. In a game that was as full of team spurts as any you'll see, Dallas stunned Miami tonight to even the NBA finals at a game apiece. With the Heat leading by a seemingly comfortable 88-73 well into the fourth quarter, Jason Terry scored with 6:18 left to launch an improbable 20-2 run that put the Mavericks ahead 93-90 with 26 seconds remaining. After Miami tied the game with a three, Dirk Nowitzki hit a layup in the closing seconds for a 95-93 Mavs win (play-by-play sheet). The Heat's 88-73 lead itself was the product of a Miami 13-0 burst. Miami also enjoyed a 15-1 run spanning the second and third quarters, converting a 51-42 deficit to a 57-52 lead. UPDATE: Neil Paine at Basketball Reference has more on Dallas's comeback.